Not to be confused with Pale lager. The higher proportion of pale malts results in a lighter color. The term "pale ale" first appeared around 1703 for beers made from malts dried with coke, which resulted in a lighter color than other beers popular at that time. Different brewing practices and hop levels have resulted in a range of taste and strength within the pale ale family. Coke had been first used for dry roasting malt in 1642, but it wasn't until around 1703 that the term "pale ale" was first applied to beers made from such malt. By 1784, advertisements appeared in the Calcutta Gazette for "light and excellent" pale ale. By 1830, the expressions "bitter" and "pale ale" were synonymous. Breweries would tend to designate beers as pale ale, though customers would commonly refer to the same beers as bitter. It is thought that customers used the term bitter to differentiate these pale ales from other less noticeably hopped beers such as porter and mild. By the mid to late 20th century, while brewers were still labeling bottled beers as pale ale, they had begun identifying cask beers as bitter, except those from Burton on Trent, which tend to be referred to both as pale ales. Amber ale is a term used in Australia, France and North America for pale ales brewed with a proportion of amber malt and sometimes crystal malt to produce an amber color generally ranging from light copper to light brown. A small amount of crystal or other colored malt is added to the basic pale ale base to produce a slightly darker color, as in some Irish and British pale ales. In France the term "ambrée" is used to signify a beer, either cold or warm fermented, which is amber in color; the beer, as in Pelforth Ambrée and Fischer Amber, may be a Vienna lager, or it may be a Bière de Garde as in Jenlain Ambrée. In North America, American-variety hops are used in varying degrees of bitterness, although very few examples are particularly hoppy. In Australia the most popular Amber Ale is from Malt Shovel Brewery, branded James Squire in honour of Australia's first brewer, who first brewed beer in Sydney in 1794. American Pale Ale (APA) was developed around 1980. The brewery thought to be the first to successfully use significant quantities of American hops in the style of APA and use the name Pale Ale, was the Sierra Nevada Brewing Company, which brewed the first experimental batch of Sierra Nevada Pale Ale in November 1980, distributing the finished version in March 1981. Anchor Liberty Ale, a 6% abv ale originally brewed by Anchor Brewing Company as a special in 1975 to commemorate Paul Revere's midnight ride in 1775 which marked the start of the American War of Independence, was seen by writer on beverages, Michael Jackson, as the first modern American ale. Fritz Maytag, the owner of Anchor, visited British breweries in London, Yorkshire and Burton upon Trent, picking up information about robust pale ales, which he used when he made his American version using just malt rather than the malt and sugar combination common in brewing at that time, and making prominent use of the American hop, Cascade. The beer was popular, and became a regular in 1983. Other pioneers of a hoppy American pale ale were Jack McAuliffe of the New Albion Brewing Company and Bert Grant of Yakima Brewing. American Pale Ales are generally around 5% abv with significant quantities of American hops, typically Cascade. Although American brewed beers tend to use a cleaner yeast, and American two row malt, it is particularly the American hops that distinguish an APA from British or European pale ales. The style is close to the American India Pale Ale (IPA), and boundaries blur, though IPAs are stronger and more assertively hopped. The style is also close to Amber Ale, though Amber Ales are darker and maltier due to use of crystal malts. The origins of the name lies in the tradition that it was matured/cellared for a period of time once bottled (and most sealed with a cork), to be consumed later in the year, akin to a Saison. There are a number of beers named Bière de Garde in France, but some of the better known brands include: Brasserie de Saint-Sylvestre, Trois Monts (8.5% abv); Brasseurs Duyck, Jenlain (6.5% abv); and Brasserie La Choulette, Ambrée (7.5% abv). Blonde ales are very pale in color. The term "Blonde" for pale beers is common in Europe and South America - particularly in France, Belgium, the UK, and Brazil - though the beers may not have much in common, other than color. Blondes tend to be clear, crisp, and dry, with low-to-medium bitterness and aroma from hops, and some sweetness from malt. Fruitiness from esters may be perceived. A lighter body from higher carbonation may be noticed. In the United Kingdom, golden or summer ales were developed in the late 20th century by breweries to compete with the pale lager market. A typical golden ale has an appearance and profile similar to that of a pale lager. Malt character is subdued and the hop profile ranges from spicy to citrus; common hops include Styrian Golding and Cascade. Alcohol is in the 4% to 5% abv range. The UK style is attributed to John Gilbert, owner of Hop Back Brewery, who developed "Summer Lightning" in 1989, which then won several awards and inspired numerous imitators. Belgian blondes are often made with pilsner malt. Some beer writers regard blonde and golden ales as distinct styles, while others do not. Duvel is a typical Belgian blonde ale, and one of the most popular bottled beers in the country as well as being well-known internationally. Later in the second half of the nineteenth century, the recipe for pale ale was put into use by the Burton upon Trent brewers, notably Bass; ales from Burton were considered of a particularly high quality due to synergy between the malt and hops in use and local water chemistry, especially the presence of gypsum. Burton retained absolute dominance in pale ale brewing until a chemist, C. W. Vincent discovered the process of Burtonization to reproduce the chemical composition of the water from Burton-upon-Trent, thus giving any brewery the capability to brew pale ale. The expression first appeared in the early 19th century as part of the development and spread of Pale Ale. 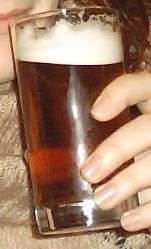 Breweries would tend to designate beers as "pale ale", though customers would commonly refer to the same beers as "bitter". It is thought that customers used the term bitter to differentiate these pale ales from other less noticeably hopped beers. Drinkers tend to loosely group modern bitter into "session" or "ordinary" bitter (up to 4.1% abv), "best" or "special" bitter (between 4.2% and 4.7% abv) and "strong" bitter (4.8% abv and over). In the United States, the name can describe a darker amber ale or a "red" beer that is a lager with caramel coloring. India Pale Ale or IPA is a style of pale ale developed in England for export to India. The first known use of the expression "India pale ale" is in an advertisement in the 'Sydney Gazette and New South Wales Advertiser' on 27 August 1829. The color of an IPA can vary from a light golden to a reddish amber. Scotch Ale was first used as a designation for strong ales exported from Edinburgh in the 18th century. The term has become popular in the USA, where strong ales which may be available in Scotland under a different name are sold in America as "Scotch Ale", for example, Caledonian's Edinburgh Strong Ale or Edinburgh Tattoo, is sold in the USA as Edinburgh Scotch Ale. As with other examples of strong ales, such as Barley wine, these beers tend toward sweetness and a full body. Examples from the Caledonian brewery would have toffee notes from the caramelizing of the malt from the direct fired copper. This caramelizing of Caledonian's beers is popular in America and has led many American brewers to produce strong toffee sweet beers which they label as a Scotch Ale. Scotch ales are an accepted style in Belgium: Gordon's Highland Scotch Ale, with its thistle-shaped glass is a well-known example, produced by the British-connected John Martin Brewery. Scotch Ale or Whisky Ale is a designation used by brewers in France for peat-smoked malt flavoured beers. This style is distinct from the Scotch ales mentioned above, for instance having a translucent amber color, rather than opaque brown, appearance, and a smoky rather than sweet taste. Even though the malt used by distillers in Scotland is no longer dried by peat burning, some peat smoke flavor is added during malting by an additional process. The most popular French example is Fischer's Adelscott. The brewer Douglas Ross of the Bridge of Allan brewery made the first Scottish Whisky Ale for the Tullibardine Distillery in 2006; the beer was made with unpeated malt and aged in whisky barrels that had not contained a peated malt whisky so has a vanilla and nutty profile. 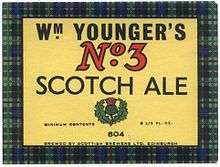 Scotch Ale is sometimes conflated with the term "Wee Heavy", as both are used to describe a strong beer. Examples of beers brewed in the USA under the name Wee Heavy tend to be 7% abv and higher, while Scottish-brewed examples, such as Belhaven's Wee Heavy, are between 5.5% and 6.5% abv. McEwan's Scotch Ale is also 8% abv. Strong pale ales are ales made predominantly with pale malts and have an alcohol strength that may start around 5%, though typically starts a bit higher at 7 or 8% by volume and may go up to 12%, though brewers have been pushing the alcohol strength higher. In 1994 the Hair of the Dog Brewing Company produced a Strong Pale Ale with an alcohol by volume (ABV) of 29%. In 2010, Brewdog released "Sink the Bismarck! 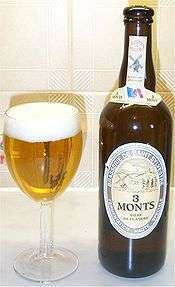 ", a 41% ABV pale ale, which is stronger than typical bottling of distilled spirits of 40% ABV. Orval typifies the Belgian pale ale style, and is fermented with some Brettanomyces in addition to Saccharomyces yeast. ↑ "Roger Protz on India Pale ale". www.beer-pages.com. Retrieved 3 October 2010. ↑ Paige Williams (May 2003). "Atlanta, Vol. 43, No. 1". Emmis Communications: 104. ISSN 0004-6701. Retrieved 3 October 2010. ↑ D. E. Briggs; J. S. Hough; R. Stevens; Tom W. Young (1982). Malting and Brewing Science. Springer. p. 810. ISBN 0-8342-1684-1. Retrieved 3 October 2010. ↑ James Squire Amber Ale - Michael Jackson 1 October 2001: "The designation Amber Ale is to be taken seriously". ↑ Randy Mosher (2011). Tasting Beer. p. 212. Retrieved 8 July 2011. ↑ Sam Calagione. Brewing Up a Business. John Wiley and Sons, 2011. Retrieved 8 July 2011. ↑ "Sierra Nevada Our Story". sierranevada.com. 2009. Retrieved 8 July 2011. ↑ Maureen Ogle (2006). Ambitious Brew. Houghton Mifflin Harcourt. p. 305. Retrieved 8 July 2011. 1 2 3 Michael Jackson (1997). Michael Jackson's beer companion. Running Press. pp. 161–162. Retrieved 8 July 2011. ↑ John Holl (2011). "CraftBeer.com | Featured Brewery: New Albion Brewing". craftbeer.com. Retrieved 8 July 2011. ↑ Michael Jackson (2011). "Michael Jackson's Beer Hunter - How Bert Grant Saved The World". beerhunter.com. Retrieved 8 July 2011. ↑ "CraftBeer.com | American Ales". craftbeer.com. 2011. Retrieved 8 July 2011. ↑ Chris Wright (2007). The Beer Journal. Lulu.com. p. 38. Retrieved 8 July 2011. ↑ Eric Asimov (28 June 2010). "Sampling American Pale Ales - NYTimes.com". The New York Times. New York: NYTC. ISSN 0362-4331. Retrieved 8 July 2011. ↑ Andy Crouch (2010). Great American Craft Beer. Running Press. p. 126. Retrieved 8 July 2011. ↑ Chris Wright (2007). The Beer Journal. Lulu.com. p. 56. Retrieved 8 July 2011. ↑ Marty Nachel (2008). Homebrewing For Dummies. For Dummies. p. 128. Retrieved 8 July 2011. ↑ "Hop Back Summer Lightning « Beer Culture with Des de Moor". desdemoor.co.uk. Retrieved 5 June 2010. ↑ The dictionary of trade products ... - Google Books. books.google.co.uk. Retrieved 3 October 2010. ↑ "The Irish Red Paradox". Beoir. 2011. Retrieved 12 May 2011. ↑ "Classified Advertising.". The Sydney Gazette and New South Wales Advertiser (NSW : 1803 - 1842). NSW: National Library of Australia. 27 August 1829. p. 3. Retrieved 17 August 2013. ↑ "Caledonian Edinburgh Scotch Ale from Caledonian (S&N, Heineken), an English Strong Ale style beer". Ratebeer.com. 5 November 2010. Retrieved 12 August 2014. ↑ The Prague Post Online Archived 29 February 2012 at the Wayback Machine. ↑ Russell, Inge (2003). Whisky: technology, production and marketing. Academic Press. p. 63. Retrieved 24 February 2012. ↑ "All you need to know about beer". beer-pages.com. Retrieved 25 April 2008. ↑ "Scottish Beers". camra.org.uk. 2013. Retrieved 25 March 2013. ↑ Gilmour, Alaistair (2011). The Oxford Companion to Beer. Oxford University Press. Retrieved 24 February 2012. ↑ "McEwan's Scotch Ale". BeerAdvocate. 14 June 2007. Retrieved 14 June 2007. ↑ "Michael Jackson's Beer Hunter - A Mild to Snap Your Braces At". Beerhunter.com. Retrieved 12 August 2014. ↑ "Hair of the Dog Dave from Hair of the Dog Brewing Company, a Barley Wine style beer: An unofficial page for Hair of the Dog Dave from Hair of the Dog Brewing Company in Portland, Oregon , United States of America". Ratebeer.com. 26 September 2013. Retrieved 12 August 2014.